Explore the terrain between San Francisco to Portland, or reverse, in eight days. Embark on this Oregon and California outdoor adventure tour and follow the stage coach trails and highways that have long connected these choice west coast cities. Savor San Francisco, sparkling city of the Golden Gate, west coast center of art, culture and finance– one of the most visited cities in the world. Drive scenic Highway 101 through Alfred Hitchcock country into the heart of the Redwood Empire. Follow a stagecoach road from Crescent City up to Stout Grove, a majestic stand of old-growth redwoods and longtime attraction for travelers– including George Lukas, who filmed Return of the Jedi there. The schedule below will give you an overview of the other places and activities you can expect on these west coast tours through California and Oregon. We plan frequent stops for walking, exploring, and taking photographs. Meet your group and tour guide at the hotel in San Francisco, then head to Sausalito for some beautiful views of the bay area, complete with a short walk to a viewpoint and a drive across the famous Golden Gate Bridge. Receive your tour documentation and spend some time going over the route while enjoying dinner as a group – a drink and appetizer is on us. One night in San Francisco. We leave San Francisco in the early morning over the Golden Gate Bridge, traveling through California wine country to Bodega Bay, where Alfred Hitchcock filmed “The Birds” in 1963. We enjoy a picnic lunch along scenic Highway 1. 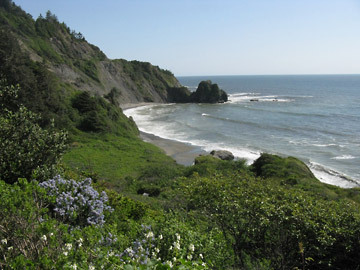 Next highlight is Mendocino with its art community and galleries. Near Fort Bragg we reach the Mendocino Coast Botanical Gardens with 47 acres of ocean front gardens and a trail along thunderous waves. Night in Fort Bragg. After touring the Norther California coast, we will travel through the incredible Avenue of the Giants in Humboldt Redwood State Parks, home of the tallest trees in the world. We will have a chance to hike among these ancient giants, some of which are more than 2 millennia old. For the evening we will head to the beautiful Victorian village of Ferndale, where we will stay in a wonderful Bed and Breakfast. Our journey leads us through Redwood National Park, keeping an eye out for herds of elk often found grazing along the road. We visit the Trees of Mystery with its strange tree formations, local folklore and art work, and a wonderful collection of historic Native art. We explore the Pacific coastline, stopping to view Crescent City’s lighthouse before heading north into Oregon. We spend the night in on the beach in historic Bandon, Oregon. 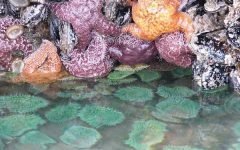 A tide pool in Bandon, Oregon. In store for us today is iconic Face Rock Beach, beautifully landscaped Shore Acres Gardens and a pleasant hike along the Oregon Coast Trail with fantastic views of the rugged coast. Next we head inland to the Rogue Valley where we will stay the night in the friendly small town of Ashland Oregon, famous for the Oregon Shakespeare Festival. Two nights in Ashland. Today we will take time to explore Ashland with it’s shops and galleries and wonderful Lithia Park. We will take a short mountain hike on the Pacific Crest Trail with views of the great Mount Shasta volcano. We will also have the opportunity to visit one of Southern Oregon’s wonderful wineries. A drive along the Volcanic Legacy Scenic Byway brings us to Klamath Falls, where we visit the Favell Museum, built from a private collection of Native American art and artifacts. After a stop at Fort Klamath, an important outpost in the Modoc Indian War, we proceed to Crater Lake, a caldera lake famous for its deep blue color. We stroll along the rim with views of Wizard Island. Next, we head to Bend Oregon, and up-and-coming town on the Descutes River with easy access to the volcanic Cascade mountains, the high desert and wonderful waterfalls and lakes. We spend 2 nights in Bend. 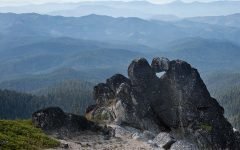 Today we visit fascinating lava landscapes, hiking over a hill of volcanic glass at the obsidian flow in Newberry National Monument. Then we stroll and picnic along scenic Paulina Lake. We spend the afternoon at the High Desert Museum with its many inside and outside displays and endless information on the natural and cultural richness of the high desert. Evening and night in pedestrian-friendly Bend. First stop this morning is Smith Rock State Park, with its deep river Canyons and spectacular views. Then on to Santiam Pass Scenic Byway, which provides dramatic views of the snow-capped Cascade Mountains. We stop at wonderful Clear Lake for a picnic and hike to the beautiful Sahalie Waterfalls. Next, we move west, heading back to the seashore. We drive along the Pacific Coast Byway towards Yachats and the Heceta Head Lighthouse. We check into an ocean resort in Waldport for the night. 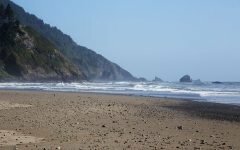 Today we continue north along the craggy Oregon coast, stopping for occasional walks and viewpoints and for sales-tax-free shopping at a factory outlet mall. At the tasting room of the Tillamook Cheese Factory we can sample most popular cheddar cheeses of the Northwest. We walk and picnic at a state park with lovely beach trails and views. Then on to Portland, one of the most vibrant cities in the Pacific Northwest. Tour ends here. You are free to explore Portland on your own or fly home. We will gladly assist you with post-reservations. If you have any questions about our Oregon and California outdoor adventure tour please feel free to contact us at info@traveldreamwest.com.